I first met Steve when I was making The Ultimate Guitar Book, and I was taken aback by the quality and breadth of his guitar collection. 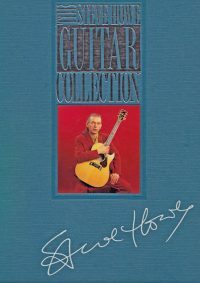 I’d always known he had a lot of guitars, but when he took me to his secret lockup in west London and showed me some of the riches within, I knew there had to be a good book in there, too. 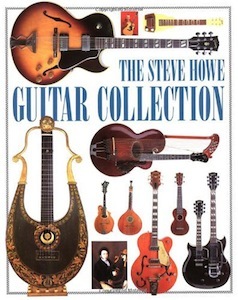 And so there was … The Steve Howe Guitar Collection. I spent many happy days with Steve down at his farmhouse in Devon going through the guitars and hearing his recollections about how and why he got them and about their appearances on various records and tours with Yes, Asia, GTR, and ABWH, as well as on Steve’s solo outings. You can read an extract from one of my interviews with Steve for the book by clicking the link here. There’s everything in TSHGC from 19th century lyre guitars to Steve’s famous Gibson 175, from an art deco lap steel to a chopped-up Broadcaster, from a five-course guitar made around 1780 to a Stepp digital guitar made around 1980. There are plenty of stories, too, that delighted Yes fans just as much as guitar fans when the book appeared in 1994. At first, it came with an arty transparent paper jacket … which proved a tad too artistic and a tad less robust. So we soon replaced it with the more conventional jacket you see on the left, which highlights some of the stars of the collection. Both versions had the same cloth case under the jacket (pictured below) with a portrait of Steve and his signature.